Datamax-O'Neil microFlash 2te - Mobile Printer, Print Method: Direct thermal. 203 dpi, Print width 1.89" Interface Options: Serial, RS-232. Eight generations of innovations and a relentless pursuit of reliably have resulted in the Datamax-O-Neil microFlash 2te - the smallest 2" printer with a design proven to thrive in the mobile environment. The microFlash 2te prints outstanding quality 2" direct thermal receipts, proof of deliveries, invoices, barcodes and labels. Whether in serial or wireless mode, the microFlash 2te is the printer of choice around the globe for field mobile service, route accounting, direct store delivery (DSD), logistics, home delivery and pre-sales systems. The Datamax-O-Neil microFlash 2te is amazingly small, in fact, it's up to 33% smaller than competitive rugged printers! 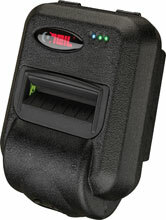 The microFlash 2te is the only printer that provides the durability required in the demanding field mobile environment. Rugged enough to withstand multiple 6' drops to concrete, the microFlash 2te direct thermal printer is designed and engineered to withstand even the most punishing portable applications. From its peerless internal printing mechanism to its unbreakable high-density polyethylene case, the microFlash line of printers are lauded worldwide for providing the most reliable printing, shift after shift, month after month, and year after year. The Datamax-O'Neil 200383-100 is also known as ONE-200383100	or 200383100	.